Any photo taken in Instagram will automatically post directly to your Instagram feed, sharing the picture with the world (or at least whoever follows you). But what if you want to take a picture or two with the Instagram app, apply those fancy filters, and not actually share them with anyone? That’s not an option directly within the Instagram app itself, but you can use a neat little trick on the iPhone (or Android if it floats your boat) to indirectly obtain such an ability yourself. 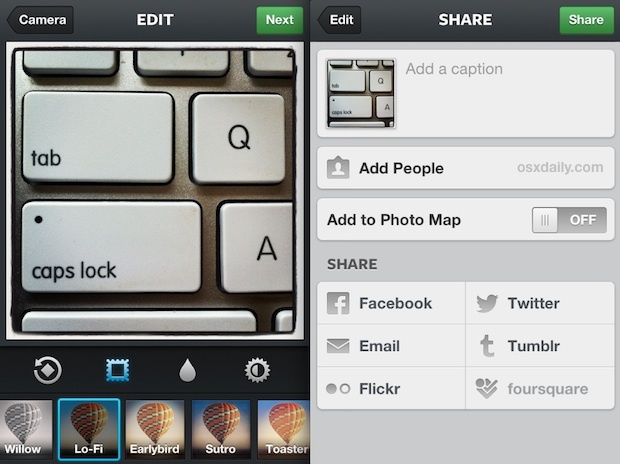 This works to both take pictures with Instagram without uploading them, and also apply and save filter additions to images without uploading them to Instagram. That latter option means you can basically apply multiple filters to the same photo if you want to. It’s essential to tap the X and remove the picture from the upload queue, otherwise the photo could actually upload when you do toggle AirPlane mode off and use Instagram again the future. That’s all there is to it. Because AirPlane mode turns off all data transmission, the sharing process will fail and the image will never upload to Instagram, keeping it locally on the iPhone instead. Simple and effective, even if it is a bit quirky. 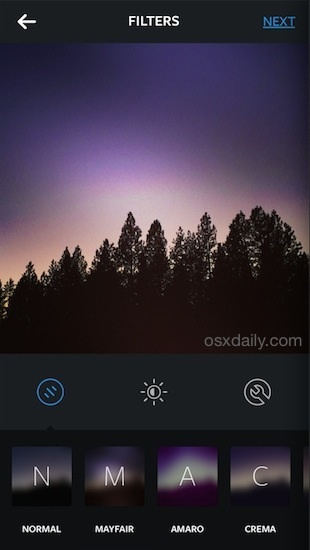 And yes, this works the exact same in every version of the Instagram app, new or old. This is a pretty handy trick if you want to apply some instant filters to images and not alter then directly with apps like Snapseed or AfterGlow. I discovered this by accident the other day when I lost cell service, but as Petapixel points out, intentionally toggling AirPlane mode is actually a useful strategy if you’re looking to gain filters without uploading images to your IG feed. Just remember to turn AirPlane mode off again when finished, otherwise the iPhone will be left without service. 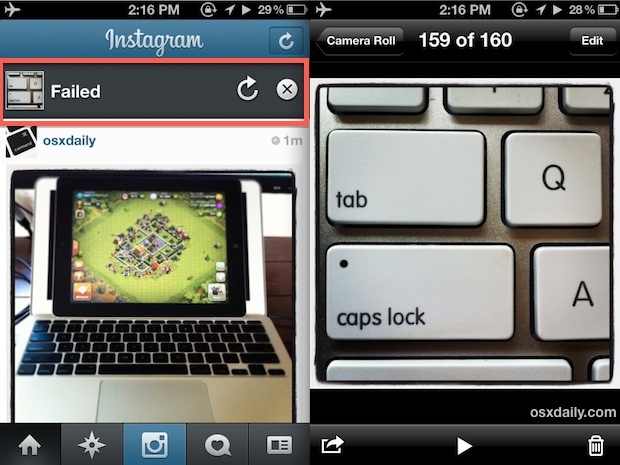 Want to see some other cool Instagram tips? Head over here! You could actually apply filters to a picture and send it as a Direct Message to yourself (your name should be included in the recipients list) and send. Open the DM and download the picture you sent yourself.